I can't stay for chit chat tonight sorry, I have a stack of papers I must read before work tomorrow. Damn you paying job! Here is another Smitten Polish from the Confection Collection. This is Glass Elevator. I wasn't sure if I was really going to love this polish, until I put it on. This one was so much better on the nail than in the bottle. 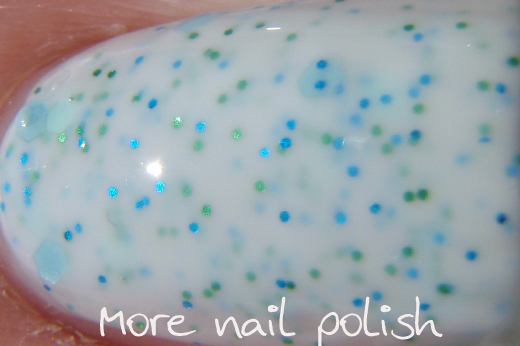 Glass Elevator has aqua and light blue micro glitters and iridescent aqua hexes in a very pale milky aqua base. Application was really good considering it was a white milky polish, but I did use three coats for this mani. It also dried very smooth and I only put on one coat of Seche Vite top coat. Do you remember where you can grab Smitten polishes? I'll give you the links anyway. Smitten Polish Etsy Store and updates on Noelie's Nails blog. Ok, now Im in love with this one! I'm not usually into the milky/white based ones, but I really like this one!